I think food provides us the quickest way to understand each other's culture. Each dish reflects the long history of culture of each country, race and region. Talking over such dishes is the first step in promoting understanding. I love to eat anything (well as long as it doesn't fall within my totally subjective cute food category) and I particularly enjoy fish. however, I discovered an exception to my love of eating fish when I was in iceland and experienced hakarl. during our first evening, the group I was with was treated to a dinner of traditional icelandic food and drink. during the cocktail hour, cheerful servers circulated with trays of appetizers. on one tray were little white cubes, the tray was presented to me. I asked the server what it was and she responded "fish." I probed no deeper, thinking of course, "oh fish, it will be delish!" I picked up a toothpick and speared one of the cubes and popped the sucker in my mouth. long story short, it was the most disgusting thing I've ever experienced. I immediately grabbed a napkin and spit it out, then went in search of some type of alcoholic beverage to kill the taste and disinfect my mouth. soon I went in search of my traveling companion gig to warn her not to eat the little white cubes. unfortunately, as soon as I saw her I realized I was too late. she had just popped one of those little suckers in her mouth. unfortunately for her, her reaction to the repulsive little cube was not to spit it out but to swallow it as quickly as possible. hakarl is considered a delicacy in iceland, however, I have to agree with anthony bourdain when he declared that it is "the single worst, most disgusting and terrible tasting thing " he has ever eaten. 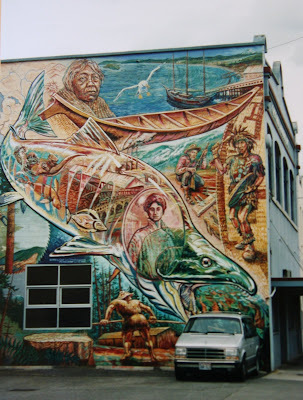 4) mural in bellingham, washington. from 1997-2000 my daughter em lived in bellingham. on one visit I snapped this picture of a downtown bellingham mural. I don't know if it is still there, I sure hope so. the mural does a wonderful job capturing and celebrating the area's culture and it's connection to the land and sea. 5) fishing boats off the coast of cape breton, nova scotia. 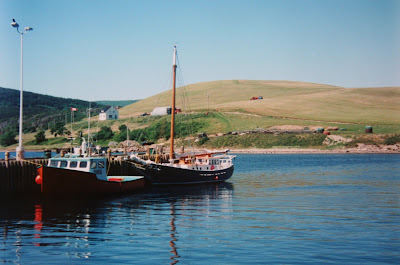 photo taken during a family vacation to nova scotia in 1996. this photo, like the two preceding it was taken with film and then retaken with my digital camera - so pardon the poor image quality. 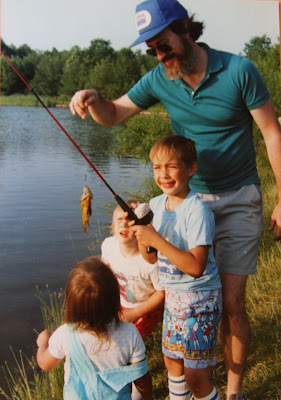 7) fishing fun with uncle f.... this photo was taken a while ago at the annual yanoshik family picnic in pennsylvania. my niece mara, whose back is to the viewer, just turned 23 - her brothers who are also in the photo I believe are 25 and 27 - but I could be wrong, I can never keep the ages straight for all the 'kids' that grace our lives. I included this photo because I just loved the look of accomplishment and glee on adrian's face as he holds up his first catch! Beautiful once again, Kimy - I especially love the mural - I hope it's still there too! Wonderful pix & quotes: I especially like the Thoreau & Christina Rosetti quotes-- & great song pick-- love Ramblin' Jack, & he really does Woody G's songs so well. What an eclectic approach to the theme! I liked listening to ol' Jack again. Okay, still working on mine, and I won't get it posted yakking to people on Blogger all morning! Heh, heh! I love the mural too- so clever isn't it, to get that perspective when working so close to the wall. No doubt there is a technique for this! What comes across in your photos and notes is your real interest in the subjects. Just an observation from a very unqualified non-photographer! that should say 'TRAVELLING in your head'.. I especially love the mural photo that you took in Bellingham. I wonder if anyone has ever compiled photos of murals with local themes. I love to find them wherever I travel, too. I just sent the mural image to my older son (the daddy of the baby). He graduated from Western and lives in Bellingham, so I asked him if the mural is still there. I'll let you know what I find out. ooh-ooh! fabulous from top to bottom, great song and would I love some sushi just about now! We saw that mural in B'ham in spring '07 when we were last there! Great photos and quotes, glad to learn about hakarl... a good defensive lesson. Fabulous posting. I love the first photo especially, very eye-popping! You've had such varied and interesting experiences, which make it an adventure to read your posts. Loved learning about hakarl, which I'd never heard of before. Beautiful photos, you captured every aspect of fishing, even th sirens's song!! Terrific ramble with the images (even without Rambling Jack). Sushi is something I cannot eat. Just absolutely cannot. Oh, well. Wonderful range of photos today and thank you for always giving the details, it's nice to see not only a picture but get a bit of the story behind it, as well. Anthony and I have something in common - we swallowed - and agreed on the experience! And I think you're right about the museum and sculpture. What can I say, very nice and always interesting. The first quote had me immediately thinking of my father. : ) Good memories of fishing with him...I think sometimes my parents got divorced because my dad fished too much but then I remember that he was out there every day looking for something else. Gotta love that first photo and the one with the kids and their uncle is charming. C and I had fun looking at the fish from Zagaras. She especially loved the colors of the red snapper and has now declared it her 'favorite fish always' which will last at least until she falls asleep tonight. Great pix as always. Loved the Ramblin' Jack song! 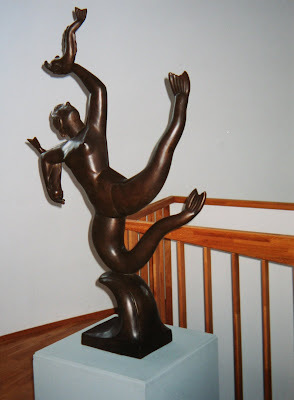 Love the sculptures! Love the stories! Love the quotes! I am not brave enough to try raw fish...pickled is about as adventurous as I get. Nice collection of fish here. Tasty too. I am obsessed with water and the sea. Wonderful post. I loved the comment on compassion by Merton linking it with the interdependence of all living beings. Today, allover the world, including Tibet, ecological degradation is fast 0vertaking us. I am wholly convinced that, if all of us do not make a concerted effort, with a sense of universal responsibility, we will see "the gradual breakdown of the fragile ecosystems that support us, resulting in an irreversible and irrevocable degradation of our planet, Earth. I like the ending line of the second. 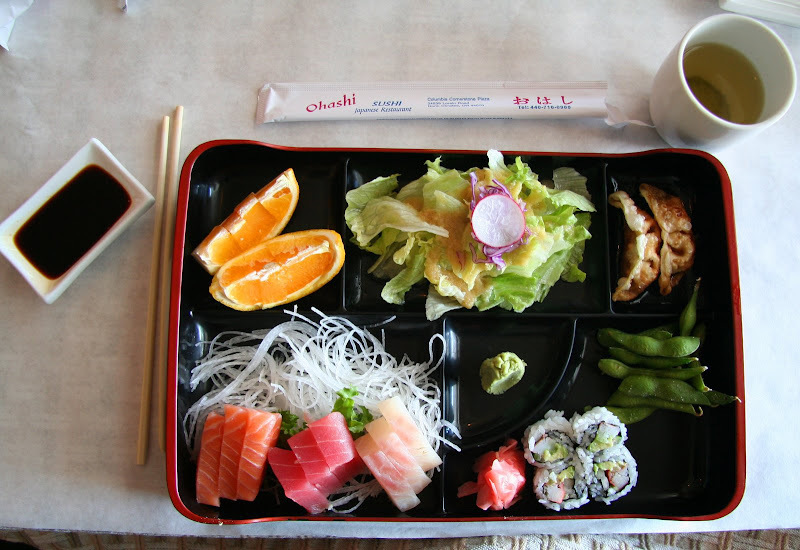 ooo... the sushi picture looks delicious. now i'm craving some. I'm not a big fish eater, but I am aware of the health benefits of a high fish diet. I must do more tuna or salmon or something. Omega whatever is good for you. Love that fish eating the car! I love the Frank Gehry fish! That's so awesome! 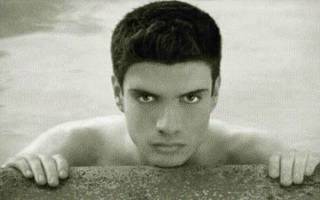 I've never seen a pic of that before. I liked the quotes. And the statue of the mer-lady with the fish is beautiful. Thanks. I've been to Barcelona, but didn't see the Gehry. Another reason to go back! .& You broke a dream I had last night!I dreampt someone served me Sushi SO raw it was still wriggling! 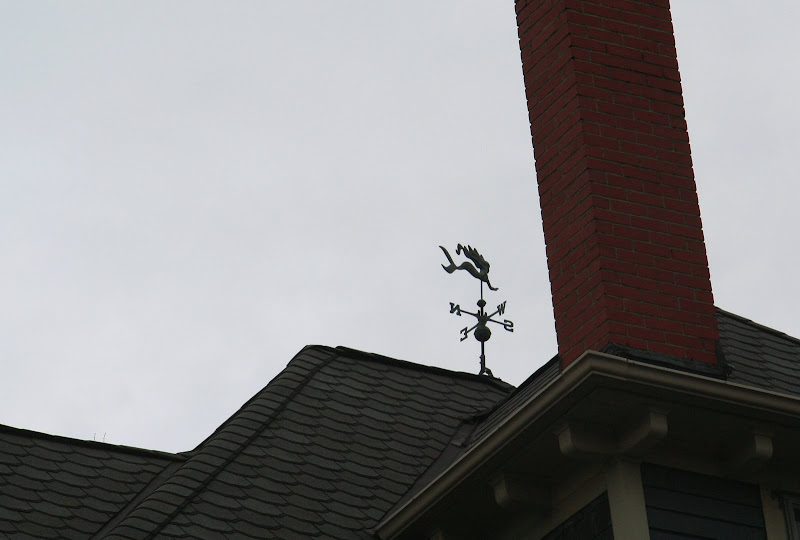 LOVE the weathervane. The mural is very strange, don't you think? The sushi pic makes me hungry. Happy V Day dear Mouse. Thank you so much for the birthday card! I was such a nice surprise. Have fun with tut - give her my love. hi everybody....thanks for all the great comments.... sorry I didn't keep up and respond to the comments as they came in but tut-tut was in town starting thursday and we were busy!!! time flies when you are having fun and it goes really fast when you are meeting a friend for the first time.... blogging is such an unusual phenomena on how we create community and friendship with people all over the place....sometimes if we are lucky we get to meet our cyber community face to face! each meeting is unique as each of us is unique, but every time I have been fortunate to meet a friend from the cyberhood there has been a sensation that we have met before.... does that make sense? I want to thank you for visiting my site and I can see that I have a lot of work to do on my Thursday Themes, but still had fun with it. I promise as time goes by it should hopefully get better. I love your pictures and your story of the bad fish eating experience. I hope by my not eating it, that there will always be enough for those that love to eat it. Anyway thank you again for the visit. I finally got round to this one, Mouse. Great collection of snaps and quotes! 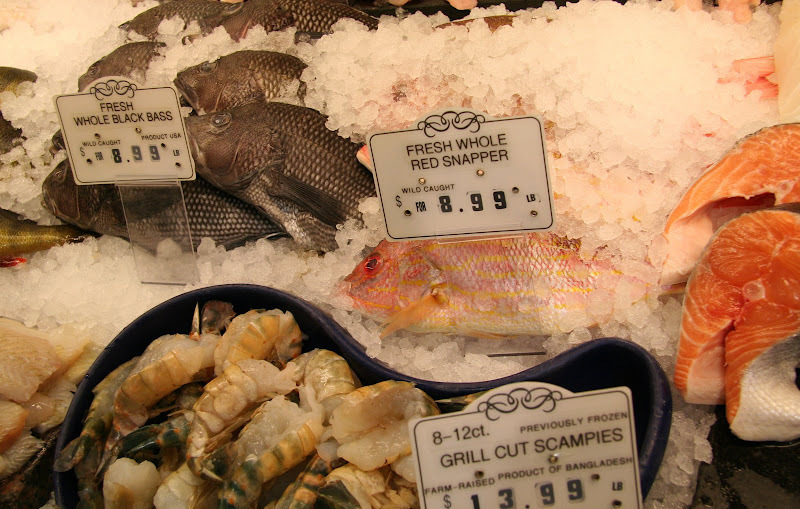 I'll take that mermaid weather vane but $8.99lb for red snapper? Ouch! My wallet! The mural in Bellingham looks like many in my 'hood. On my many visits to Bellingham, I don't remember ever seeing it.